We're crafting cannabis cultivation. Join us and help us grow our community of marijuana growers! 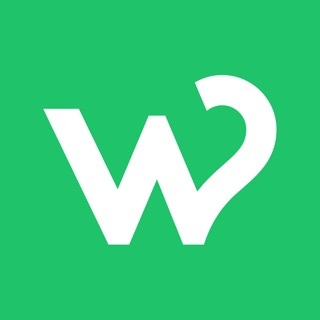 WeGrow 2.0: Measure, Manage, Optimize, and Learn marijuana home grow recipes. We're along for each step of the cannabis growing process. - Measure: Easily record the five essential factors that affect marijuana plant growth in your grow journal: light, carbon dioxide (CO2), nutrients, water, and temperature. 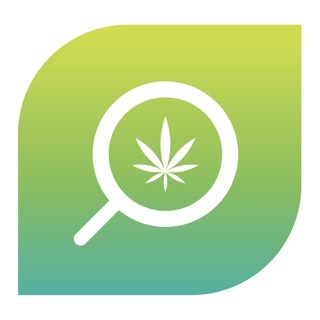 - Manage: Manage cannabis plants in different stages of the grow cycle. Keep track of each cannabis plant(s) in your garden. - Optimize: Each strain of cannabis differs in their preference of the five limiting factors, experiment and create your own craft cannabis grow recipes. 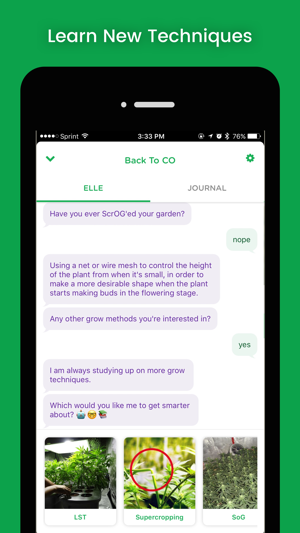 - Learn: Chat with ELLE, your personal Growbot™, as you progress through the different stages of your plant’s growth and get timely information for a successful harvest. 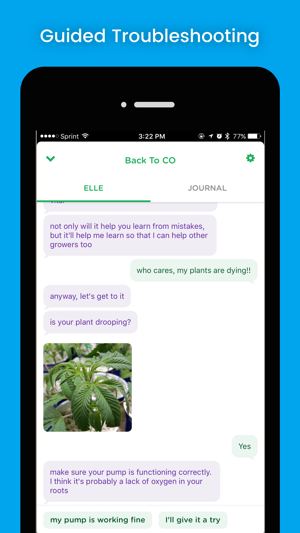 Our new chatbot-based educational platform teaches cannabis consumers to home grow through simple conversations. 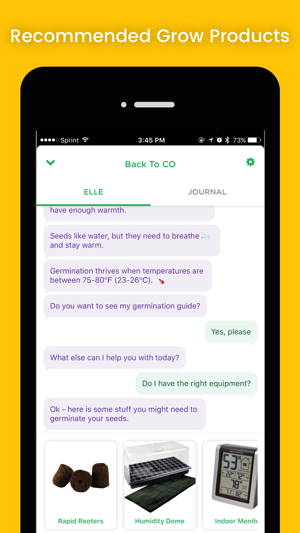 This technology makes it easy to set up a grow space and journal the grow, with timely information delivered via our Growbot™, ELLE, when you need it. In addition, the chatbot technology makes it very simple to take a deeper dive into specific topics. Growing Instruction: Receive coordinated growing educational modules to optimize your plant’s growth as you progress from seed to harvest. Learn through Conversations: It’s simple. Chat with ELLE, your personal grow-master, to learn what you need to know for a successful grow. Recommended Grow Systems and Products: ELLE makes personalized recommendations on grow systems, equipment and nutrients to make your gardening life enjoyable and efficient. We believe cannabis has the potential to be a natural catalyst to wellness for so many people. WeGrow provides the educational resources in your pocket for at-home cannabis growers in order to achieve better living and enhanced well-being. Everyone should have an accessible and easy way to grow the strains of marijuana that are best suited for them. Right now a simple Google search - “How do I grow marijuana?” or "How do I grow weed?" lands you in a world of confusion and intimidation. What you find are multiple websites that all have differing opinions on the best way to grow high quality weed. Needless to say, it is a frustrating learning process. It shouldn’t be that way. So we set out to build a community that measures, shares, and discovers cannabis cultivation together. We've made a number of improvements to the applications. We now support HomeKit sensors. Automatically add Temperature, Humidity, and CO2 levels into your grow journal. Add an energy sensor and begin calculating how much electricity a grow cost you. You can now add multiple grow rooms and move plants from room to room. And we've updated the look of your grow cards a bit. Keep the feedback coming. Happy Growing! 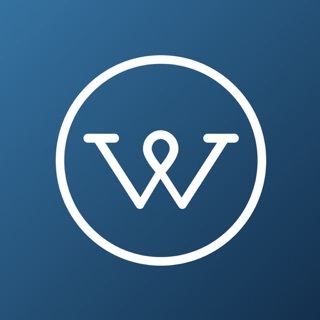 This app consolidates all of the growing information out there into one place and gives it to you in an easy to understand format. Elle talks to you every day and makes sure you're doing what's necessary to keep your plants healthy. The journal is also a great way for me to keep track of my notes, the temperature and nutrients I'm adding. The only feedback I had was to add how to grow in different mediums other than hydroponics but I reached out to the team and they're already working on it 👍🏽. Will continue to use this app to keep track of my grows. Love it minus a few minor things. I love this app. It’s exactly what I’ve needed in a grow app. I just wish there was an option to grow different mediums in the same room. Example, I’m growing one in soil and the rest in my DWC. That added functionality will be spectacular. Also, editing notes shouldn’t be so difficult/impossible. I do hope it gets updated for the iPhone X soon but the crop isn’t that big of a deal. Hopefully in the future, smart lighting controls and full automation through HomeKit accessories will be possible. Those things aside this is still my #1 grow log and will continue to be. Looking forwards to future updates! 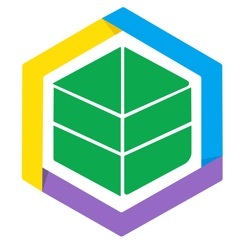 The best growing app out there! 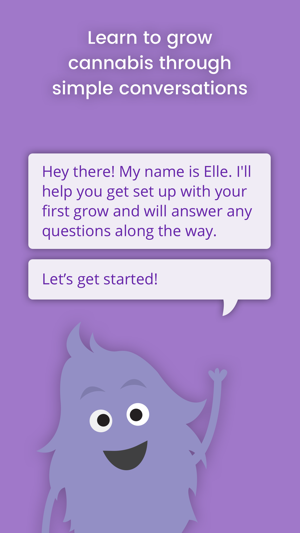 The chatbot Elle is charming and full of grow tips and information. The journal and camera are extremely convenient. I’ve always wanted to learn how to grow but didn’t know where to start or how to do it. I'm so happy I came across this app! !